Lowrise neighborhoods throughout Seattle are seeing new construction that is grossly out-of-scale with the surroundings. This 5+ story building constructed in 2014 towers over one and two story homes in an Eastlake Lowrise 3 neighborhood. 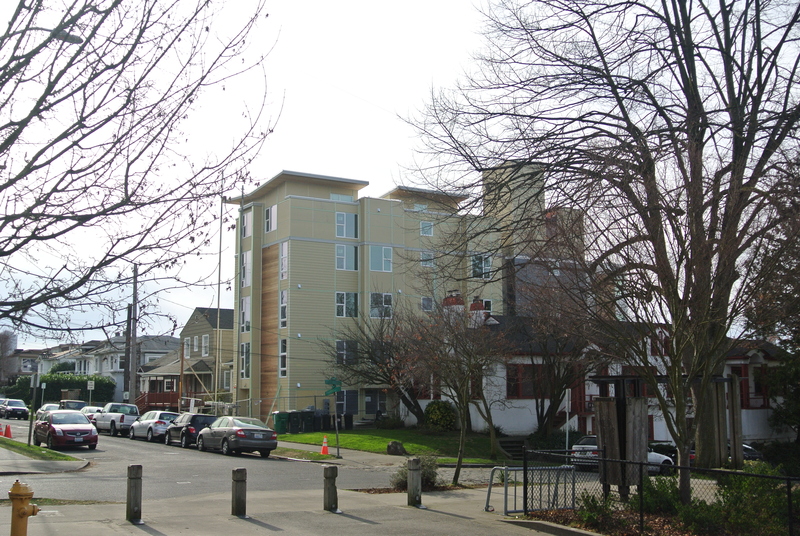 At its February 2014 meeting, the Capitol Hill Community Council passed a resolution asking the City of Seattle to impose a moratorium on any new construction over 40′ high in the lowrise residential zones until the City Council passes legislation allowing no part of any structure in those zones to exceed 40′ in height measured from the lowest point on the property. The only allowance for projections above that height would be for essential rooftop features, specifically: elevator mechanics, stairwells and HVAC systems. While this resolution differs from what SSU’s petition calls for, it is nonetheless a step in the right direction. Our sincere thanks to CHCC’s Jeffrey Cook for taking the initiative on this. We are hopeful that other Community Councils across the City will soon follow suit. WHEREAS: The Capitol Hill Community Council desires to respond to the complaints from thousands of citizens in its community and the city about out-of-scale tall buildings crowding out existing residents, and WHEREAS: The Council is aware that unprecedented development is happening around Capitol Hill in general as a result of abused incentives, and is having a major impact in particular on the quality of life along our multi-family zone streets, and WHEREAS: City Council President Sally Clark has stated that the 2010 legislation to increase heights has resulted in unintended consequences for our neighborhoods by allowing buildings to reach well above the intended four stories, THEREFORE the Capitol Hill Community Council requests that the Seattle City Council and the Department of Planning and Development instigate a new set of development legislation that caps all new construction types at a total maximum allowable height of 40 foot/four stories as measured from the lowest point on the property, inclusive of all roof top features, with the exception of elevator mechanics, stairwells or HVAC systems, in order to better bring new construction into scale with existing multi-family zone properties. Further be it resolved that we request a moratorium on new construction seeking to build over forty foot heights until this legislation is enacted.